What’s your favorite gemstone cut? If it happens to be the pear-shaped cut, I am right with you. There is something about that shape that is uber-rich looking in a stone. They also have the lovely quality of making your fingers look more slender and delicate. Whenever I see a large carat weight pear-shaped diamond or Cubic Zirconia, I think about Elizabeth Taylor’s jewelry collection. 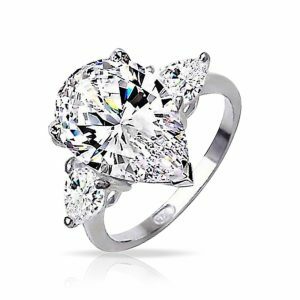 Below are 3 pear-shaped CZ engagement rings that celebrate the lovely, unique qualities of this cut. This is a ring that cannot go unnoticed. If you are the type of girl that loves “super-chunk” gemstones, you can’t get much larger than this. 7 carat weight center stone accented by 2 unique 0.4 ct. weight trapezoid cut side stones. Made of Sterling Silver plated with Rhodium. Has a wide, modern band design that creates a well-balanced setting for the large stones. Made by Berricle, it gets nice reviews for believable sparkle and shine. Isn’t this one a beauty? The refraction of rainbow hues within the stone give it a magical quality. This play on light is one of the reasons that I go gaga over well-faceted clear gemstones. You can’t tell by looking at it, but the setting is made of triple-plated brass. 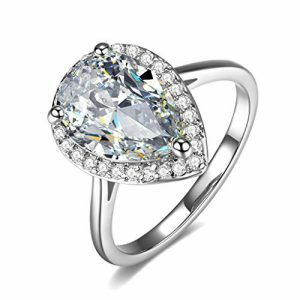 Both the large center stone and the round accent stones are Swiss -cut high-grade Cubic Zirconia. Other than the fact that this ring is so pretty, I had to list it here because the price is amazingly affordable. If I could get away with saying just one word about this ring it would be wow. This is no wall flower design, that’s for sure. I love the product description on Amazon that says go big, or go home. This beauty is made of 925 Sterling Silver. The mega center stone is 5.50 carats of pear-shaped brilliance. This is an opulent looking ring for any occasion. It comes in a wide range of sizes from 4 to 14. 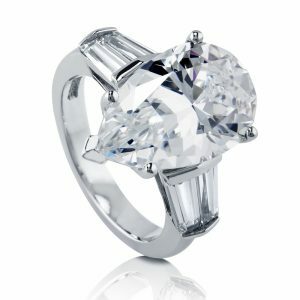 Fake diamond rings like the ones featured on this page also make stunning cocktail rings, special occasion jewelry, or amazing gifts for the bling lover in your life. What Does It Mean If You Are A Pear Cut Aficionado? If you absolutely adore the pear cut variety, you are a thoroughly modern lady with feminine grace, sophistication and elegance. You enjoy combining the traditional and the modern into one unique style you can call your own. The stone shapes we love give us a clue about our personalities. Isn’t that interesting? The above video really shows off the beauty of a pear cut engagement ring. Gorgeous! The company who created this video, Chic Jewelry, sells high-end CZ rings on gold or platinum settings. Just browsing through their website speaks volumes about the advances of fake diamond ring design and quality. We are lucky enough to live in a time where faux stones look incredibly real and the price points cover every budget. 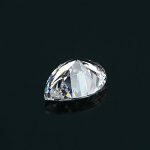 This solitary large carat pear cut loose stone even looks pretty upside down and unmounted. I love that you can order these little sparklers loose and create your own jewelry business if you want to. I would be tempted to string them together as bling beading all around my bedroom and hang them in the sunlight at my kitchen window. Loose or set, a well-cut CZ is a thing of brilliance.